ProDOK NG® is the I&C CAE system for the planning and operational support of I&C installations. Wherever ProDOK NG® is used, rational, consistent project planning and consistent documentation are guaranteed. 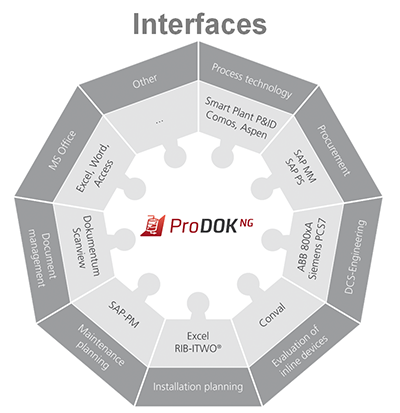 ProDOK NG® ensures an integrated planning process with unified rules. The scope of ProDOK NG‘s functions comprehensively fulfills the requirements of I&C project engineers for the project phases of basic planning, function planning, realization planning and installation planning - whether the planning of new projects, alterations or extensionsis concerned - and provides optimal support in the operative phase. Data centric application – any data to be entered exactly once and then picked and placed in different drawings/ documents. Logical structure tree – Process parameters / Signals generated / Device type - helps to visualize the scenario better. Standardization of documents as they are generated on standard reports/ typicals. Single point storage of data. Any change in drawing/database gets adjusted through all document groups. Prevention of manual errors such as duplication of tag number, cable number and mismatch wiring . User-friendly copying and editing functions support the efficient & quick creation of new project document from existing project data. Import/ export utilities help in integrating and sharing project data & documents with vendors. Interface to SAP MM and PM. Redline, Markups, Notes support maintenance tasks. No software required to navigate I&C documents - Internet Explorer/Mozilla Firefox/Netscape Navigator is sufficient. Powerful search function to navigate through Plant Documentation.